2) Someone mentioned that they wished I had a way to follow my blog via e-mail. There is an option to do that on the top right sidebar of my blog. It's a black and white icon that looks like an envelope. When you click on that, you can type in your e-mail address to sign up for it. 3) A reader suggested that I put Mark's mailing address on the sidebar of my blog, so that it's easily accessible, because she couldn't find it when she was looking for it. I thought that was a great idea, so if you're interested in sending Mark a card, the P.O. Box address is in the left sidebar. 4) And speaking of Mark, a few people have asked if he needs/wants anything they may be able to send. I ask him every time I go visit what he wants me to bring, and he almost always says a milkshake. He's got a lot of music and DVDs, and he really doesn't need much right now! But if you'd like to send something, a McDonald's gift card would be very useful for his milkshakes or coffee ;) Thanks so much for thinking of him! I didn't do anything at all for my actual birthday yesterday, unfortunately. Jerry had to work from 7 a.m. to 7 p.m. My parents said they'd keep the kids overnight, so that Jerry and I could go out, so we planned to go out to a late dinner. We did go to one bar/grille place, but it was packed full of the Saturday night crowd of drinkers, and at 32, I'm too old for that scene! ;) So we just went home and had a quiet evening, which was nice. It was from my favorite bakery, and it had a peanut butter cream filling (and chocolate buttercream frosting)! He knows me SO well. At first I thought the cake was chocolate, but when I saw that it was yellow cake, I was even happier--I like yellow cake more than chocolate. We ate a piece last night before bed, and it was delicious. And isn't it a cute cake?! Today, we planned to celebrate my birthday with the kids. The weather was really crappy all morning and early afternoon, so it didn't look like we'd be able to go anywhere, but it cleared up enough for us to go out to dinner. We ended up going to Olive Garden--I hadn't been there in YEARS, and I don't think the kids had ever been there. I'm really excited that I've been able to have this big cake in my house and I haven't eaten it all. I'm still binge-free, thanks to the Brain Over Binge mentality, and I feel "safe" having what used to be trigger foods in the house. It's so strange! But in a good way. Jerry bought me a birthday gift, which I wasn't expecting (we usually don't buy gifts for each other). 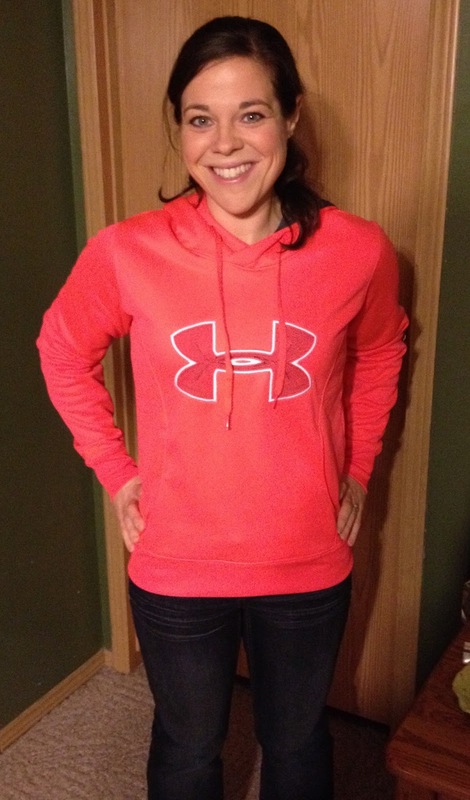 It was an Under Armour hoodie, and I absolutely love it! I wish I had some birthday shenanigans to write about, but the weekend was actually really boring, thanks to the ridiculous weather. It's supposed to be extremely cold tomorrow, too, and I'm guessing that the kids' school will be canceled yet again. I ran out of ways to keep them occupied a long time ago! We're under a "Wind Chill Watch" until Wednesday, which means that the kids probably won't have school until Thursday. I'm SO ready for spring! OMG I am drooling over that cake! I LOVE anything with chocolate and peanut butter so that cake would be right up my alley. If you were my neighbor I'd be knocking on your door for a piece. Glad you had a great birthday weekend! I'm not seeing your blog show up on my feedly or my blogger reading list either. I actually only saw this post because I came to your actual site to make sure it was still up and running (no pun intended). Technology is weird some times. Happy belated birthday! Your cake is adorable, and I'm glad you are doing so well with "trigger" foods in your house. That might be the best gift. I am going to buy that book...I need the help!! Yay! I was just going to look for the post with the address in it and now you have it on the sidebar!! (although, it's on the left sidebar and not the right sidebar!) I'm getting another card ready to send out tomorrow. I agree, this weather is ridiculous and it's time for it to stop! The cake is really cute! The weather in NE Ohio has been equally crappy this winter. My birthday is in December, but I've decided I'm going to start celebrating it on my half bday in June so I can do something fun and outdoorsy like a baseball game or picnic. I would like to add in that my feed is not updating either, and hasn't since the 24th of January. :( Hope it fixes itself soon! I quit getting your blog on email since the 24th also. I made sure I'm still subscribed. How it works out soon. I am set up to receive the blog by email and it hasn't worked for the past three days. The first day I thought, how weird that Katie didn't post...maybe they lost power or something. Then the 2nd day I was worrying that something bad happened. By day three I began to wonder if it just wasnt coming by email and came to your page directly and was relieved to see that all is well that you were still blogging away lol. Hoping that it all gets corrected quickly. I love waking up to the blog in my inbox. Its the first thing I read each morning! :) Take care and Happy Birthday! Happy belated birthday! I suggest that you have a 1/2 birthday this summer...and have that pool party!!!! I'm reading through feedly and it works just fine. Weird! Happy Belated Birthday! My DD is a Christmas baby. She gets her birthday gifts/cake on Christmas, but party and have the dinner of her choice in July. I'm loving the bright hoodie! Happy birthday! Your cake is so cute (is that Cookie Crisp cereal on it???) and the sweatshirt color is great on you. Oh also on my RSS reader (I use feedly), it shows the first paragraph or so of your blog only. But last week it showed your whole blog entry, so I'm not sure what's up with that. Must be some setting to make it truncated. Just wanted to let you know, the issue about your feed on that post isn't that it is a long post, it is that the table that the list is in, contains a ton of formatting for each cell, (looks like it was pasted in) and that formatting is causing the post to exceed the feed limits...so don't worry about other long posts...as long as you don't paste from word processing software or the web, the posts should be fine. I can't believe your kid's school gets canceled for cold weather. If that was the case in Canada, the kids would miss half a winter of school and have to make up for it in summer. School is NEVER canceled here for any weather reason. Tough Canadians!!! My Runner's World photo shoot! Kind of a big deal!